From our standard bed linen to our premier linen range, we have something to suit all our customers from crisp white cotton sheets to fluffy luxurious towelling to help our customers give their guests a comfy night’s sleep. For the bedroom our classic range includes crisp plain white cotton sheets, pillowcases, and white cotton duvet covers, or a premium white satin stripe duvet cover for those customers wanting a little something extra to stand out from the crowd. We can also supply bathroom linen including fluffy 550gsm hand towels, bath towels or bath sheets and a 1000gsm bath mat as standard. That makes them a superior quality than our competitors range as they offer around 450gsm towels and 700gsm bath mats. Our Premier range offers the finest 200 thread count, 100% Egyptian Cotton percale bed linen that is silky and crisp to touch. 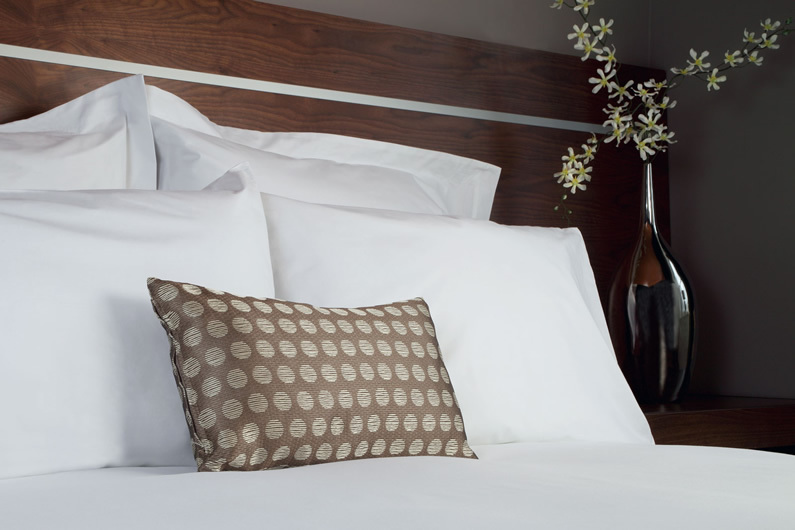 We also supply the same top of the range Percale Egyptian cotton linen duvet covers to match. We supply a range of White and Ivory table linen as standard. When the summer wedding and Christmas party seasons arrive we can also offer a range of other colours for hire. Fancy something more swish? The Afonwen premier range offers beautiful, crisp and contemporary satin band table linen and napkins. We provide this to some prestigious customers, a few of whom have secured a Michelin star for the quality of their food and linen to match.